My husband Cody and I had the opportunity to visit the Azores on our honeymoon two years ago, convinced in part from online resources touting their beauty and recently expanded tourism. One boasted that tourism is growing largely from the beautiful sites and remote, yet accessible, location. We had also read that many in the tourism industry spoke enough English that we wouldn’t have to worry that we didn’t speak Portuguese. The Azores, remote Portuguese volcanic islands, sounded like the perfect place for our honeymoon. We visited two of the nine islands, Terceira and Pico, located in the mid-Atlantic, a mere five hour flight from Boston Logan International Airport. We took advantage of the fact that our flight landed at Terceira and spent time visiting its natural wonders. The island consists of two small Renaissance cities, the historic capital and major seaport, Angra do Heroísmo. Between these seaport towns are vineyards, rolling hills, and rocky seashores. Pico has Mt. Pico, the highest mountain in Portugal, at 7713 feet. Both are sparsely populated with whitewashed houses and low stone walls, but heavily populated with cattle. “Bullfighters” traditionally taunt with colorful umbrellas. found it was too much. 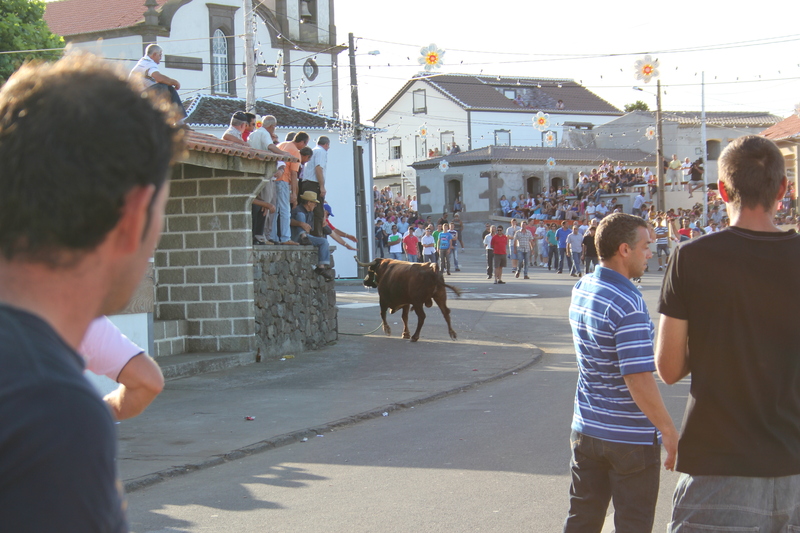 When we arrived, we found that the bull “fight” was an inaccurate translation. It was actually more of a bull “run.” Multiple bulls were delivered in crates, and ropes attached while they were still contained. When each was released, a group of men held onto the rope while simultaneously taking turns to taunt the animal. 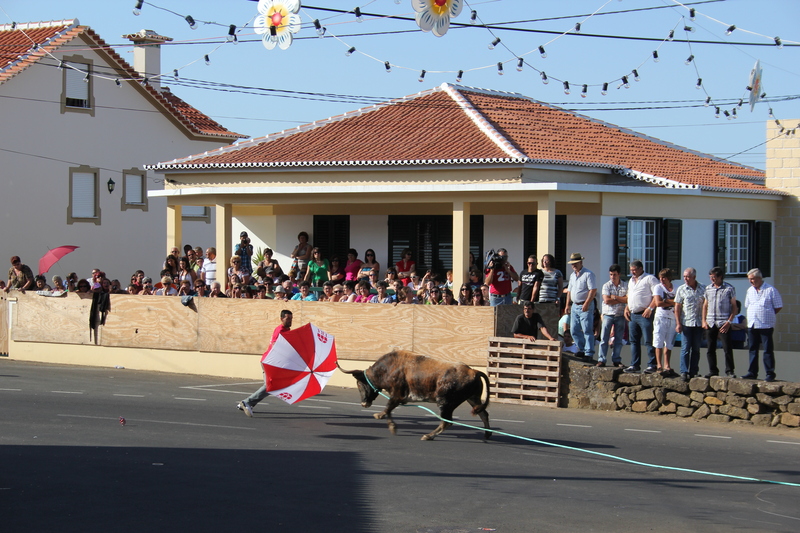 These bull runs take place in the streets of the town. Most spectators are locals and watch from the security of a friend’s stone-walled porch or upstairs windows. Others, like my husband and I, attempt to find a public place that affords some protection from the rushing bull. Our driver delivered us to a small outdoor café, set against a hillside, so that we could climb a rock wall and have both protection and front row seats. warning, informing us that what we were doing was much more dangerous than we could imagine. He informed us that the bull had enough rope to easily run to the end of the street in a matter of seconds. We realized the wisdom of his advice and, instead of turning around to follow the bull back up toward the town square, we continued down the road toward a food vendor and safety. As far as cuisine on the islands was concerned, there were limited options for dining out. After first landing on Pico Island, we stopped at what colorful umbrellas advertising coffee suggested to be a café. Inside, the barkeeper seemed confused by our request for food, but after checking the pantry supplies, she offered us fish, boiled potatoes, and salad. This was our experience at every little place we stopped for food. And, as it was at this bar, a friendly patron usually helped interpret for the barkeeper, who only spoke Portuguese, and us newlyweds, who didn’t speak any. In one case, as we pointed to different items on the menu board, the cook popped out of the kitchen holding the various ingredients of the dish to help us make our selection. The beautiful Azorean Islands feel a world and a time apart, with few modern structures and a rustic way of life visible everywhere. We visited an Occulista, or eye doctor, a small, single room storefront facing a fountain in the stone-paved square of town, and it was the only store in town that had contact solution. There was one large grocery store per town, but even those had very modest offerings compared to American standards. 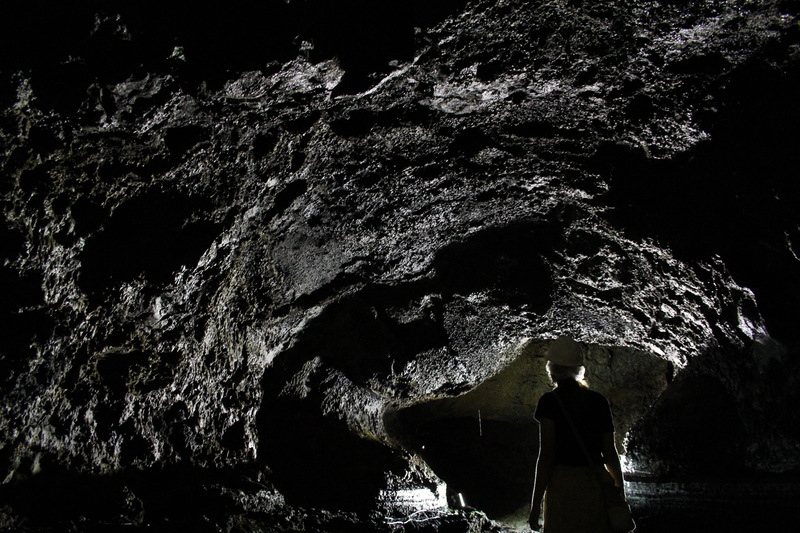 Of more interest were natural attractions, such as seaside and inland caves resulting from the island’s history of volcanic activity. Much of the terrain is clearly formed by volcanic activity, so igneous rocks are prominent, if not overtaking the landscape. Otherwise, they have been collected into orderly rows between cattle fields. Gazing from a high mountain, the landscape is a tartan pattern of stone walls. 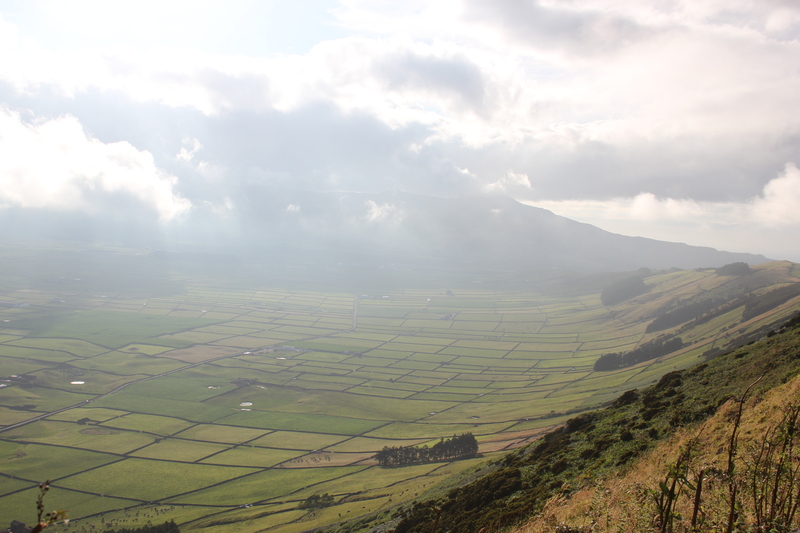 Criss-crossed landscape from Cume mountain, Terceira. 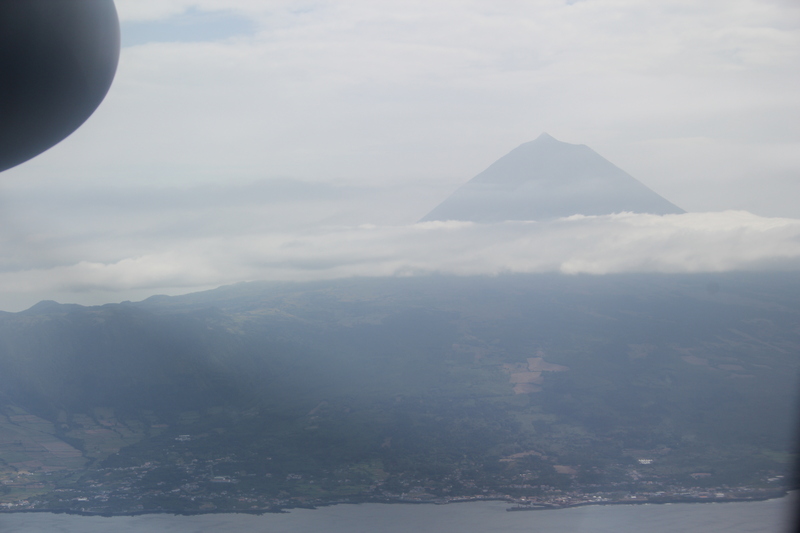 We also enjoyed our stay on Pico Island. Bed and breakfasts offer the best choices for accommodations, and we found one along the ocean owned by a European couple who spoke fluent English. We spent a day climbing Mt. Pico, the high point of Portugal. Wine and port are specialties of the area, as the dark stone reflect heat and promote sweeter grapes when collected into biscoitos, or stone vineyards. Most people make their own wine, but there are also biscoitos open to the public. View of Mt. Pico from the plane. English speakers shouldn’t expect much help from those in the tourism industry. We were unable to communicate with the woman who arrived at the airport with our rental car and contract; we were unable to tell the hotel clerk what time we wanted our wakeup call, and decided to be content with whenever he decided to call us. Still, we found all the beauty, history, and adventure of these islands as we had hoped.